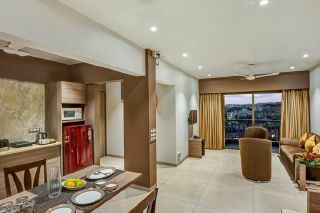 Located 3.1 km away from Powai Lake, this is an offering of a two-bedroom apartment, which can accommodate four people. The host offers the services of a caretaker and a driver. This retreat is ideal for a group of friends seeking a comfy stay. Breakfast is provided on request. Your Space The property features a garden that is dotted with swaying palms and boasts gazebo seating. The recreational area is appointed with swings for younger travellers. 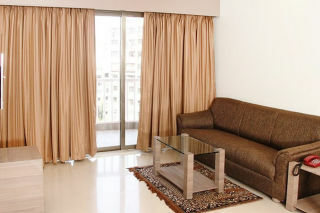 Inside the apartment, the living room houses a plush sofa and a glass-topped centre table where you can unwind. 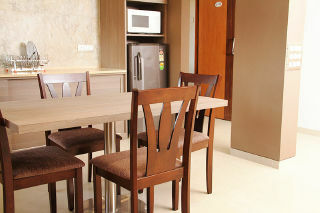 The dining room is occupied by a four-seat dining table, offering comfortable seating during mealtime. The kitchen is equipped with basic utensils for your convenience. 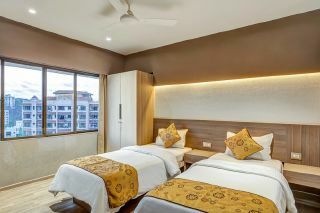 Each of the bedrooms is furnished with a couple of single beds, nightstands, and a cupboard for storage. 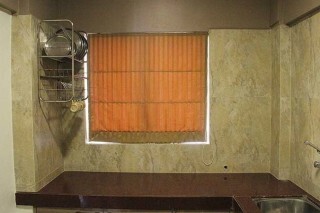 The attached washrooms are tiled and fitted with modern sanitary ware. Guest Access You and your companions can enjoy a delicious meal in the dining area. If you are driving, then we provide ample parking space for your vehicle. Guest Interaction A caretaker is present in the property to assist you throughout your stay. Also, we are just a phone call away. Neighbourhood Overview Some popular spots in close proximity are Powai Lake (3.1 km), Freezing Rain at Snow World (5.4 km), and Juhu Beach (8.9 km). 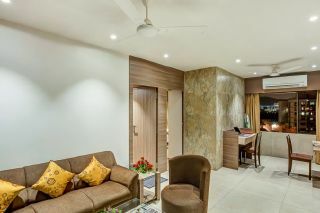 Getting Around Our property is 4.2 km from Chhatrapati Shivaji Airport, 7.1 km from the railway station, and 14.8 km from Mumbai Central Depot. You can avail the services of a cab to reach the property conveniently. Additional Information You are kindly requested to provide valid ID proof at the time of check-in. We provide Wi-Fi service on a chargeable basis. We do not host unmarried couples. The swimming pool is not open for the guests it is only for residents. Outsiders or visitors not allowed at the property only the guest who has booked can stay. Locals (people residing in Mumbai) cannot book the property. The kitchen can be accessed at an additional charge. Daily newspaper delivered in each apartment. Facilities provided to our customers: 24×7 front office services. 24×7 safety and Security in the premises. 24×7 public Transport available. Daily newspaper delivered in each apartment. Personal safe in the room. Iron with Ironing Board also available. Laundry facility on payable basis. Ample parking facility. Cafeteria. CCTV at all strategic common areas. Security Guard at the main gate of complex. Andheri Railway Station is around 7.1 km away.